Silent Hill Heaven • View topic - Abstract Daddy - fact or fiction? Post subject: Abstract Daddy - fact or fiction? The general belief is that Abstract Daddy depicts Thomas Orosco molesting his daughter. I shared the same belief until recently, when I've decided to go back to Angela's story using the other official script. Granted, the general belief does make Angela's story a tad more horrific, but I came to wonder if Abstract Daddy really does represent the sexual abuse (actually, if there were any is another matter of question) that Angela went through during her childhood. 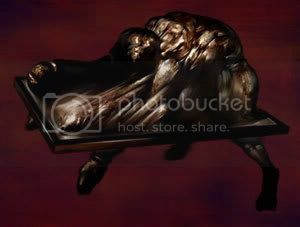 If you read the translated Silent Hill Chronicles at wallofdeath's site, and lookup the description of Abstract Daddy, you'll see that it says the name means "Ideal Father". And you have to ask yourself exactly how is a depiction of Thomas molesting his daughter be "ideal" unless Angela has warped sense of idealism. Frankly, several people may wonder if there was a translation mistake. I can tell you that at least wallofdeath's translation is correct. Silent Hill Chronicle does use the Japanese term for "ideal" and not "abstract" as in "abstract painting". I would think that if "abstract daddy" really is supposed to mean "ideal father", then I would speculate that the monster is not a depiction of Thomas molesting Angela, but a depiction of Angela stabbing Thomas to death perhaps. Quite frankly, I believe that to Angela an "ideal father" would be a dead one. In my opinion, this explanation fits with the overall theme of the monsters in Silent Hill 2. That is, all the monsters are there to remind James of what he did to Mary and not what Mary did to him. Symmetrically, if Angela has a monster, then it should remind her of what she did, and not what Thomas did to her. Aren't all the characters that are called to Silent Hill there because of what they did? This may be a reason why James is able to see Abstract Daddy as well. If Abstract Daddy, in the general sense, depicts one person taking the life of another, then it could also depict James taking the life of Mary. edit by amphreded: I added the picture for future references. Each victim of shatered or family violence usually has its own imagination of a perfect familly which they would like to live in. I believe Angela lived with her father and her mother and brother lived somewhere else. Prehaps Angie also had his 'perfect father' imagination, unfortunately the one she lived with was far from it. Thats why I think the monster rather represents her 'sexual harassment' than 'daddy kissing her lil girl after bedtime story' or, like you've said, 'dead guy' you know. And not all monsters are representing 'what he did to Mary' some of them simply representing James urges. James and Angelas paths are crossing in Silent Hill, thats why he is able to see 'her hell'. One could say that James is able to see it because they are both potential suicide but I think thats false. I do like this explanation very much except for one minor discrepancy, being the fact that Thomas was stabbed in the front of the neck and on the side. The Abstract Daddy appears to be one person on top of another, the one under lying on their stomach. It's not possible to reach around and stab someone? I didn't see it as the person lying on their stomach, for what it's worth... I don't even see another person beneath the crouched figure. Thanks for this, Burning Man. Little do things surprise or catch me off guard symbolism-wise in these games, but this post of yours did. If I could offer you cookies and tea as a sufficient kudos, well I would. i like this theory way better than the sexual abuse one.its easier to beleive and think about. I'm not saying it's not possible, just inconvienient to do. Assuming Angela is right handed and that she was, in fact, on top of a Thomas who was on his stomach, it would have been unnecessary and almost impossible to reach all the way around to his left side to stab him. I dunno. It always looked to me like one person on top of another, the "another" being on their stomach. The interpretation of the picture determines its significance. Yes, because Abstract totally means Ideal. You have a point, of course. I've thought about "abstract daddy" being 'Engrish'. The thing is that Silent Hill Chronicles stated that "abstract daddy" means "ideal father" so that non-English speakers can understand what the name means. Your theory certainly has given me more to think about. It does makes more sense that Angela wouldn't have been the figure lying on its stomach. It would be really difficult to stab someone that way. Where have I read this before? Great explanation Burning Man. It's really cleared things up for me about Angela's past. I love the theory, and it makes perfect sense. Thank you! I'm not sure whether or not I agree, but I certainly prefer the idea. >Where have I read this before? Well, a good guess might lead you to believe it was in Silent Hill 2. Last seen at: Eating at Wendy's. Any problem? Hey man, good work. A big thank you from me to help me understand the game even better. Perhaps by using the word "ideal" the developers were trying to be sarcastic? Highly doubtful. Like I mentioned earlier, the description was written for people who don't speak English. That is, they wanted to explain to those people what "abstract daddy" means. They do this for every monster, so I don't see how this one monster's description would be meant to be sarcastic. I do think it's strange though that they would literally mean "Ideal Father". It seems to me as well that it would be sarcasm (they do have it in Japanese, btw...). I mean, I want to agree with your theory, but if Thomas really was an "Ideal father", I'm sure he wouldn't beat and "force" his daughter to do anything (doesn't sound like he forced her to do her homework). James: No, that's not true at all. force me. Beat me up like he always did. yea,that tells you everything right there.the abstract daddy monster sorta looks like its suffering by its movements on the flat peice its stuck to,maybe to her,thats "ideal" for her father to be suffering. I know that. Where in Silent Hill 2 have I read this?